Maxstor is a popular manufacturer and supplier of workbench in India. With the deep knowledge of mechanical and other industrial work processes, we understand very well the requirement of proper tool necessary for the respected procedure. An organized toolkit pleasantly helps the operator to focus significantly on his task. We have designed and developed an immense range of the various types of tool cabinet to make organized inventory of tools. Perfect combination of brilliantly utilized space and sturdy construction leads minimum maintenance, maximum consumption of space. We focus on space saving method for manufacturing of the tool storage cabinet. Now-a-days due to modernization of the technology, the production styles are changing. 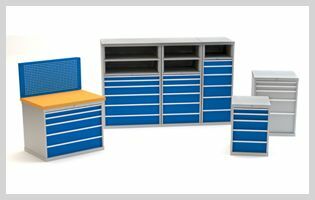 We flexibly provide wide range of tool storage cabinet, industrial tool cabinet, drawer cabinet for the specific applications. Industrial tool cabinets are specifically designed to make systematic in-line coordination. Our tool cabinets are sturdily constructed with rigid welded joints. These cabinets contain multiple drawers. They contain the load carrying capacity up to 200 KG UDL. Drawer cabinet contains divider and partition for the organized arrangement of tools. These tool cabinets are provided with central locking options like push lock and hinged bar lock with pad locking or cam locking.